Haven't been here for a while, but I have been busy creating. 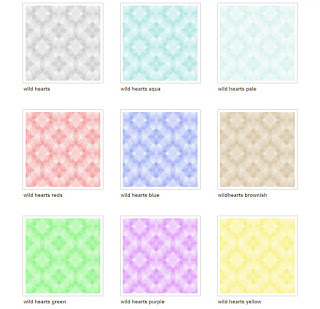 A while back I opened an account with Spoonflower where one can create fabric, wallpaper, and gift wrap. There are many wonderful vendors there selling all manner of items - if you can imagine it, someone probably offers it. But in case they don't, you can create your own. Here's a look at a collection I devised this past summer. I call this the Wild Hearts Collection. I've been having lots of fun cropping, mirroring, etc. to make these fabric designs.